This interactive desktop customizer can help you keep an eye on your inbox at a glance, easily access your favorite apps, and more. Use these cool designs as inspiration to create your own. 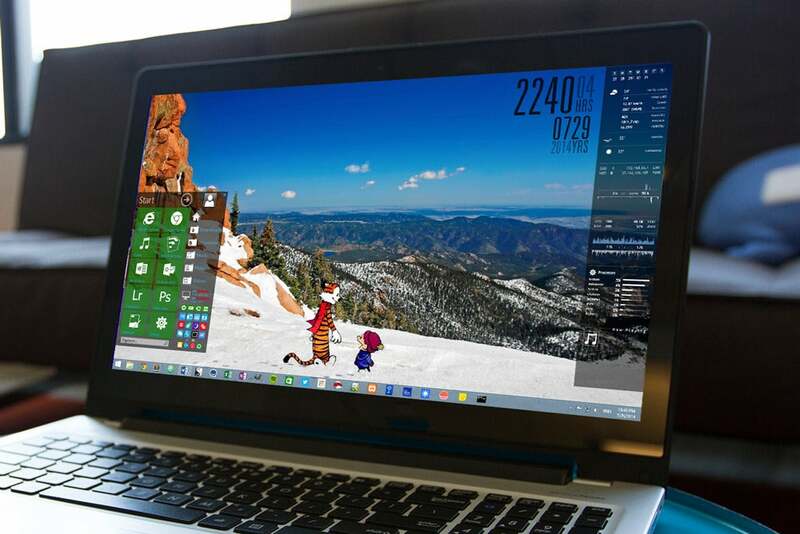 The Rainmeter desktop customization tool isn’t just about creating the coolest-looking desktop by mixing and matching different skins. Rainmeter can also help your productivity by letting you keep tabs on your inbox at a glance, know what kind of weather you’re facing outside, monitor PC system health, track the news, and take notes. Thanks to a recent Rainmeter update, these skins are also getting smarter by reacting to conditions set by programmers, such as PC temperature or an upcoming appointment. If you’re not familiar with this popular desktop tweaking tool, check out our tutorial on how to Supercharge your desktop with Rainmeter widgets. Once you’ve got the basics in hand, the following gallery of Rainmeter delights can inspire your own productive desktop design adventure. 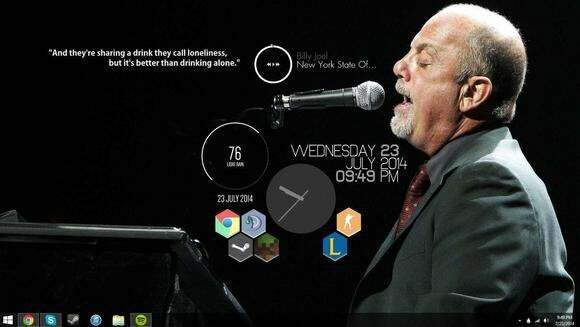 This Billy-Joel-themed desktop by Reddit user I-Draw-Sometimes uses the Honeycomb Rainmeter skin to put favorite apps front-and-center. In this case, it’s mostly games and Chrome, but you could swap in pretty much anything you want. Honeycomb does take a little more setup than other skins,and you need to know your way around the Windows file system. A short tutorial on YouTube will get you started. In addition to Honeycomb, this desktop uses Muziko for the music player, Detox for weather, Smooth Clock for the analog time, and Simple Media skin for the text-based date and time. 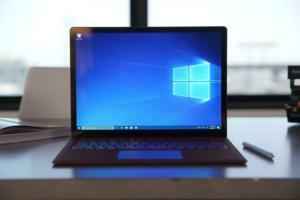 The flat, non-glossy look is in vogue for PCs and smartphones, which makes the July Flat’ish skin a nice complement to Windows 8.1. 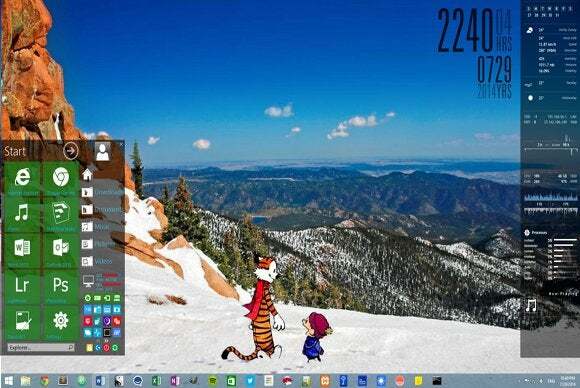 This skin can keep you productive with its notebook, weather widget, Bing search, CPU monitor, and inbox widget. Reddit user Arswaw shows just how nice July Flat’ish can look with this very clean desktop that uses a white theme in Windows 8.1. Images and icons are great, but some people just prefer text-based interfaces even in their Rainmeter widgets. 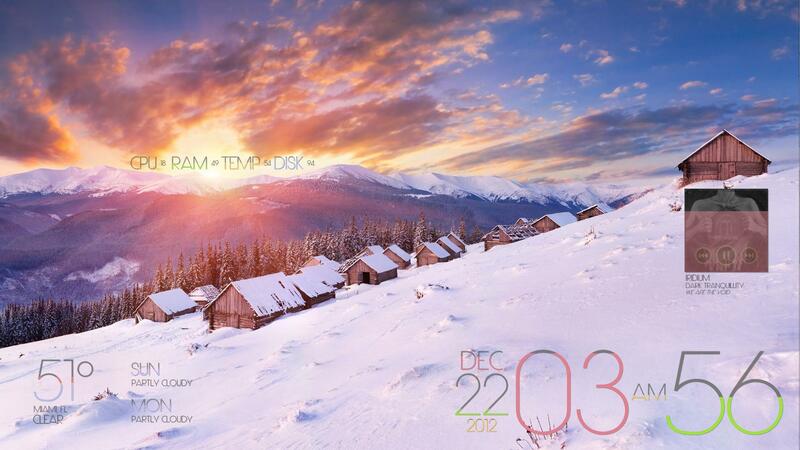 If that’s you, check out Lim!T, a text-centric Rainmeter skin with a twist. Lim!t can display CPU usage, PC temperature, the date, time, and weather. But as the “value” of each element increases so does the text size. Thus the more CPU you are using, the bigger the indicator gets. The later it gets in the morning or evening, the bigger the time gets. A great skin to give you basic information about your PC, the time, and outside conditions at a glance. We didn’t test this interesting skin found on Customize.org, but if it works as advertised, it will really help anyone in charge of security to keep an eye on things from their PC. 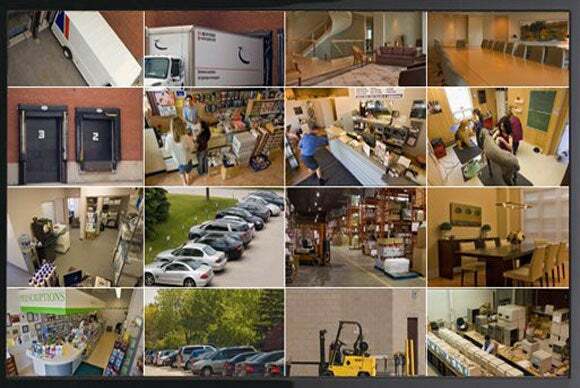 Webcamz turns your entire desktop into a grid of live security cameras. 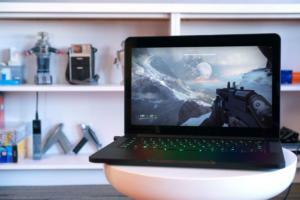 Put this skin on a dual-monitor setup, and you can keep an eye out for intruders even while you browse the Web. As its name suggests, this one’s for the stockbrokers and nervous investors keeping a close eye on their money. 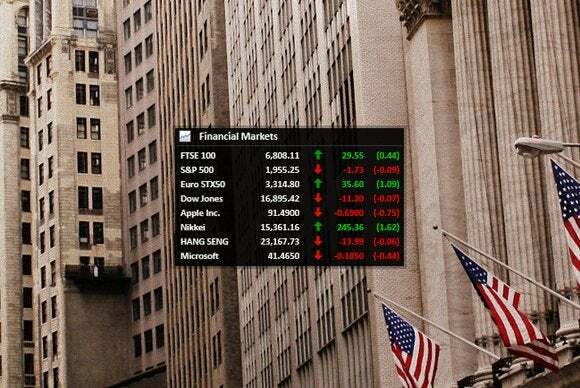 Hooked into Yahoo Finance, Market Prices lets you track financial markets with two variants, tracking either eight or five stocks and indexes. The skin also lets you sort stocks by percentage change in price. An alternative version uses data from Bloomberg.com. However, this version does not allow for sorting stocks by price. Microsoft is bringing the Start menu back to Windows after dumping it from Windows 8 and 8.1. 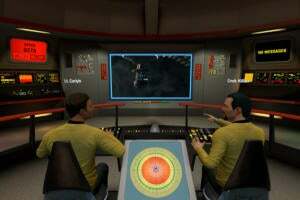 But the revised Start menu with a metro look isn’t expected to land on PCs until 2015. 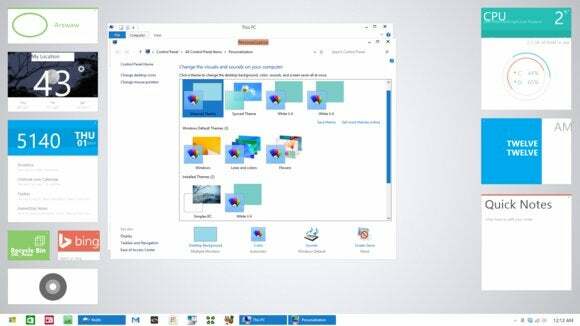 Until then, Rainmeter users can try Start Menu for Rainmeter, a derivative of an earlier and seemingly abandoned project called Multi Start Menu. This skin creates a Metro-like Start menu for launching apps that also comes packed with a screenshot tool, and quick access to your folders, the task manager, command prompt, Regedit, and the run window. Not to mention basics like shutdown, restart, and sleep. This is my own desktop, currently using elements from Enigma and the Portal 2 Desktop Theme. 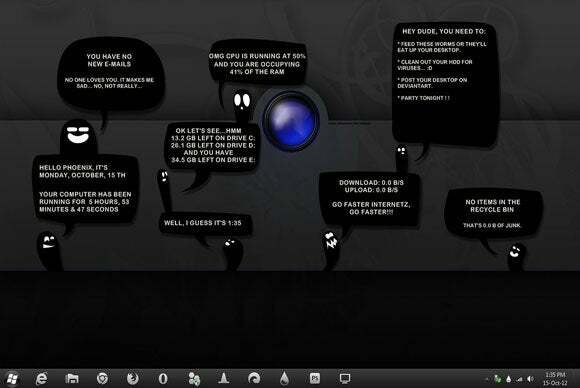 WRMZ (Worms) is kind of like the Comic Sans of Rainmeter skins, with its playful cartoon characters. But don’t be fooled: Beneath that childish veneer, WRMZ has some excellent tools to keep you productive, including an email inbox widget, to-do list, CPU monitor, disk space, clock, and Internet speed. This desktop created by DeviantArt user bowchikabow uses WRMZ and Placebo for Windows 7. Anyone wanting to keep tabs on news and nothing but news should check out VClouds RSS. This Rainmeter skin provides for up to four different RSS feeds. 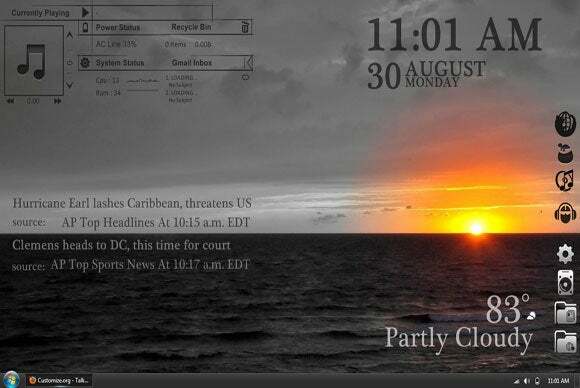 This desktop by Customize.org user godanielcroz circa 2012 uses Lexis for the calendar and weather, iTunes Monitor (Enigma), 10-Foot HUD for date and time, as well as VClouds RSS. Lexis is no longer available, but there are many skins that can replace the calendar and weather with a similar look. Customize.org user Darkhoarse really emphasizes the power and beauty of Rainmeter when you mix and match different themes. This desktop simultaneously displays a ton of information including weather, news, music player, Gmail inbox, recycle bin and other system status information. Yet the desktop doesn’t look crowded or messy at all. At play here is the defunct Fade skin for the system information, myHUDs for time, date, weather, and news. 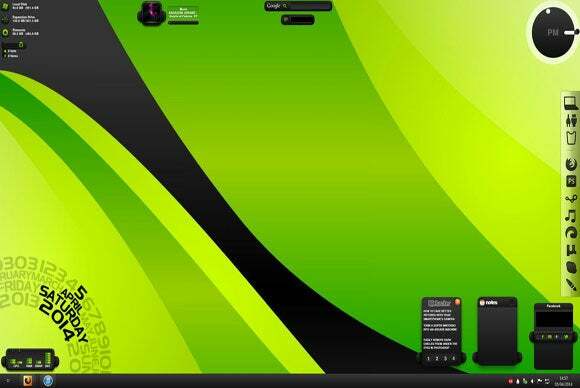 This desktop was made circa 2010, but most of the components are still available and many alternatives exist for the Fade skin. 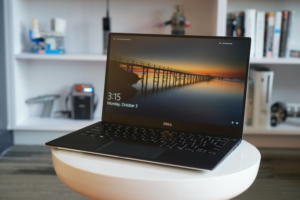 Lifehacker has had an ongoing love affair with desktop tweaks and recently featured this desktop by reader Matt Pollard. It has a very neat-looking rotating calendar, as well as widgets with RSS, notes, and social updates. 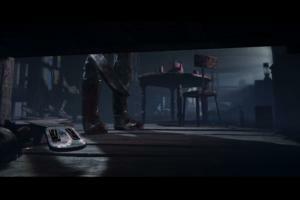 The centerpiece of this desktop is the useful Eker_lina Rainmeter suite that includes all kinds of productive widgets. Pollard also used Rocketdock, an OS X-like application launcher for Windows, along with some Rocketdock icons available on DeviantART.